This eyelash serum is closed in a golden package. The bottle contains 5 millilitres of the cosmetic. This in turn lasts for almost six months of Quickmax treatment. The cardboard box of the eyelash serum’s contains also a leaflet covering all necessary data. When it comes to application of Quickmax, it should be conducted every evening. Worth realizing, eyelids have to be cleansed and dry because any make-up residues may hinder the eyelash serum reaching eyelash roots. Furthermore, the cosmetic has to be put on upper eyelash base only, since it will find its way to reach lower eyelash roots. The application has to be systematic in order to obtain the best results. And when the desired outcomes are finally achieved, the frequency of application can be decreased. Basically, outcomes provided by Quickmax hold up to a month after the moment the treatment is over. First effects are produced after five weeks of regular use of the eyelash serum, whereas the final ones are obtained around three months. As a result of Quickmax treatment, a consumer is supposed to gain longer, thicker, regenerated and strengthened eyelashes. 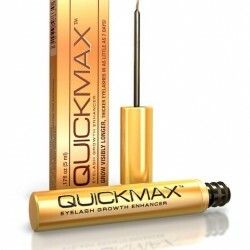 What is more, thanks to Quickamax, eyelashes become less vulnerable to damages, breakage, and falling out. Another advantage of the product, it can be used by those having false eyelashes attached since Quickmax does not dissolve adhesive. Last but not least, the eyelash serum is comprised of natural substances that are responsible for moisturizing, smoothing and highlighting skin around eyes.